When you get a tooth fracture or a cracked tooth, it comes as a bit of a shock, even if it's painless. I can remember very well when I first noticed that I had a broken tooth a few years ago; a piece of tooth enamel came off one of my bottom front teeth. You can read more about this painful condition at my page on Pulpitis. 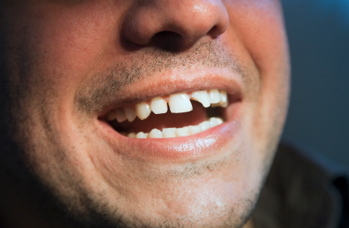 Tooth Fracture - What are the most common types? The most common type of broken tooth that I see is where the side of a tooth has broken away from a big filling. Usually, the tooth has had a large filling in it for many years, without any problems. Then, all of a sudden, a lump of tooth breaks off while you are eating. In the meantime, there are a few tricks that might help you. You can read more about this at my page on Toothache Home Remedies. If the root is cracked or broken, then the only treatment is to remove the tooth, and replace it with a denture, a bridge or an implant. Obviously, removing the tooth is the last resort. Read more about this at my page on Getting a tooth pulled.